I spent a lot of time in Gaza during the first two years of the Syrian revolution. Unlike in other social contexts, where I often hesitated to talk about Syria fearful of having to deal with stupid reactions or banal analysis, in Gaza this wasn’t an issue with people I met. Gazans who experience terror on a daily basis never failed to ask me how my family in Syria was doing, or express their solidarity with the Syrian uprising against the terror of the Assad regime. Through their own experience, they empathized with the suffering of the Syrian people, understood their desire for freedom and supported their resistance to tyranny. The news that well over a thousand people have been killed in Israel’s latest onslaught on Gaza is sickening. One of the most advanced militaries in the world is raining down bombs on 1.8 million people, over half of them children. There is no place for Gazans to escape or to seek shelter and protection with their families. They are under blockade, locked into an open air prison, in one of the most densely populated places on earth. Whole families have been massacred; houses destroyed; hospitals, schools and essential services such as water and electricity supply have been targeted. It is horror beyond words. Once again the Zionist State continues its onslaught with the acquiescence, or worse, the direct complicity of regional powers who have never done anything better than voice empty rhetoric in support of the Palestinian resistance. In fact, they have done far worse. Sisi’s regime in Egypt collaborates with Israel to maintain the blockade, and with both Israel and Saudi Arabia to pressure the Palestinian resistance to submit to a ceasefire on Israel’s terms. Meanwhile, Sisi sends weapons to support Assad’s tyranny in Syria and crushes political opposition at home. The Assad regime, that supposed bastion of the Palestinian people’s struggle for liberation, has not fired one rocket in the direction of its border with Israel since 1973. Currently it busies itself with crushing the Palestinian people in Yarmouk Camp, Damascus, with its own crippling blockade, and raining bombs down on civilians in Aleppo. And the Palestinian Authority, with its illusory quasi-state trappings, has once again shown it’s nothing more than an Israeli and Western stooge contracted out in the service of the occupation and the Ramallah elite. But the people of the region are not represented by their leaders. 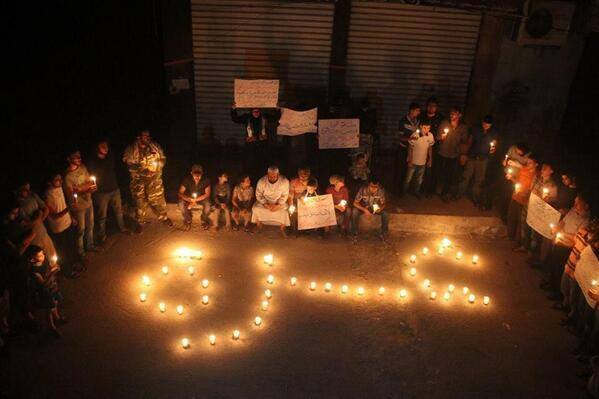 Solidarity protests with Gaza have been held in Yemen, Kuwait, Morocco, Tunisia, Jordan and Lebanon. In Egypt, at the regular protests against Sisi’s coup regime, people are chanting for Gaza. Likewise in Syria, even as Assad’s barrel bombs fall on residential areas, even as the Islamic State carries out its murderous, expansionist onslaught, even as this month alone has witnessed the death of over 3000 Syrians, men and women from Aleppo to Daraa have raised slogans in solidarity with their brothers and sisters in Gaza. Across the West Bank and 48, Palestinians have courageously risen in numbers not seen since the Intifadas. Just as the struggle to stop the bombs raining down on Gaza should not be divorced from the broader struggle to stop the Zionist colonial and apartheid project, backed by imperial powers, neither should the struggle of the Palestinian people be divorced from the broader struggle for freedom and emancipation from tyranny across the region. Only when the revolutionary aspirations of the people of the region are realized, only when the people are freed from the yoke of these current Arab leaders and the States that back them, will the liberation of Palestine pass through every city in the region and translate into practical action, side by side with the Palestinian resistance, to defeat the Zionist colonial project. Posted on July 30, 2014, in Middle East and tagged Palestine, Syria. Bookmark the permalink. Leave a comment.